Group rocket launches go a lot smoother with a sturdy, stable, multiple rod launch pad that's up off the ground to lower the risk of students stumbling over the launch gear. The Rocketry Works Cape Canaveral Launch Pad features 6 1/8 inch launch rods with blast deflectors and stand offs, and a rotatable 1 1/4 inch PVC cross rail to angle your rockets into the wind properly. It is designed to be used with the Rocketry Works Houston Launch Controller, although it is compatible with most any launch controller. Can also accept 3/16 or 1/4 inch launch rods, with the appropriate Rocketry Works launch rod mount. Two configurations--one tall, and one short--can be used to accommodate young elementary age kids or older fliers. The tall configuration keeps the launch rod tips up above the face of 6 foot tall individuals, yet older elementary age children can load a rocket onto the launch rod without bending the rod. The short configuration allows young elementary age kids to reach the rod tips, but be sure to use the included launch rod caps to protect taller kids and adults. The launch pad components come in a 15 pound bundle secured with hook and loop straps and the 4 foot length of the cross piece permits easy transport, even in small cars. The 3D printed pad accessories store nicely in Rocketry Works' 19 inch field box that comes with the Houston Launch controller, which is designed to work with the Cape Canaveral launch pad, though the controller is sold separately. 3D printed PLA launch rod mount and blast deflector pad parts come with extras so you are not stranded at a launch, and the 3D printed parts have endured more than 60 flights each during testing, and are still going strong, if a little dirty. The launch pad cross piece doubles as storage for launch rods between launches. The included 5/16 inch hex wrench secures the legs in the cross piece, adjusts the angle of the launch rods, and stores in the cross piece as a hanger for the Houston launch controller's igniter lead distribution box (sold separately). The launch rod mount has an eyelet at the base to help organize the igniter leads; just loop the igniter lead through the eyelet, and it's perfectly clear which igniter clips belong with which pad. While Rocketry Works' blast deflectors are compatible with Estes pads, our blast deflectors are made of sturdy 20 gauge (1/32 inch) steel, which is strong enough to resist warping like thinner blast deflector plates do under normal use. Rocketry Works' blast deflector stand off features a unique flared top end that serves as a stable platform to keep your rocket off the blast deflector. The Cape Canaveral pad ships with six 3-foot 1/8 inch launch rods and matching red launch rod mounts and blast deflector mounts. You can add a 3-foot 3/16 inch launch rod (and matching orange mounting gear) or a 4-foot 1/4 inch launch rod (and matching yellow mounting gear) if your launch requirements include larger models that require these rods. This pad has been tested with 2 pound kits flying on 1/4 inch rods on G motors. The launches were stable and did not damage the blast deflectors. Six 1/8 inch launch rods and matching red launch rod mounts and blast deflector mounts. Rocketry Works tradition holds that we name our launch pads after famous launch facilities, as an homage to their history and service. 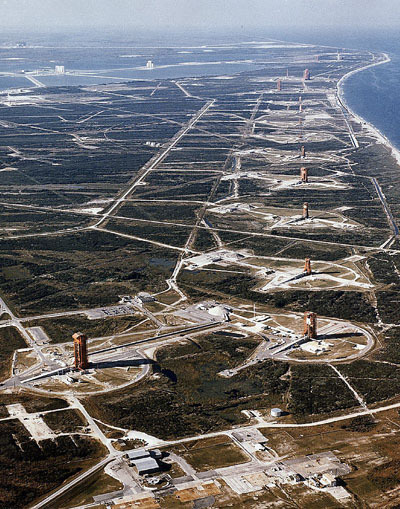 Situated on Florida's Atlantic coast, Cape Canaveral is likely the most famous launch site in history, home to U.S. V2 tests, as well as the Mercury, Gemini, Apollo, Space Shuttle, and other mission programs. The voyager spacecraft and many other unmanned space missions, satellites, and suborbital missions.We chose this sprawling and iconic launch site for our multi-pad launch pad, because it's the centerpiece of our educational rocketry launch gear.